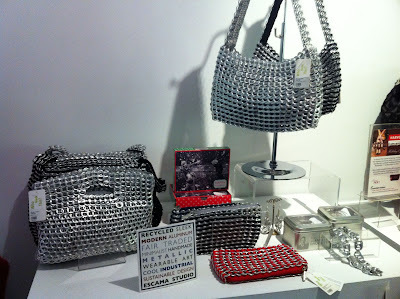 While at the Art Gallery of Hamilton last weekend, I happened across these really cool purses made with pop can tabs. Aren't they brilliant? At a price of $140 though, I think I'll pass. Please feel free to link up your Wordless Wednesday posts below and enjoy what's left of November! too pricey for me, but pretty neat idea! cool! People are so creative!! Clever!! It would be very cheap to go around a find the tops of pop cans... wonder why they are so pricey? Maybe I could make one and save the money buying one. I want one......love that idea! Great idea! But $140????!!!!!! Phew! Those are very "cool"...I bet there is a tutorial on youtube on how to make one....LOL!